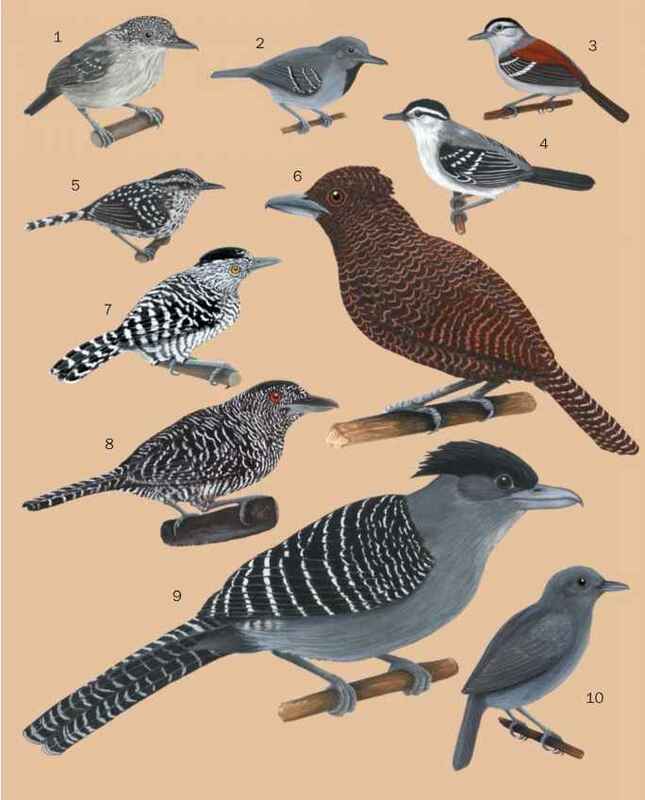 Todies are tiny, plump-bodied, large-headed, stub-tailed birds that characteristically perch with bill uptilted. Shining emerald-green above and creamy below, with a prominent crimson bib and a long, flat, bicolored red-and-black bill, each bird bears some resemblance to a miniature kingfisher or hummingbird. Visible similarities are accented by behaviors such as hovering and zooming courtship displays. Todies resemble kingfishers so much that taxonomist Linnaeus mistakenly applied a kingfisher genus (Alcedo) to the first tody described—the Jamaican. Conversely, locals in Hispaniola call todies colibri, which means hummingbird in Spanish. Individual species are distinguished by flank and belly color (pink and yellow, yellow, greenish yellow), by cheeks (sky blue, gray), and by unique vocalizations. A family trademark, the scarlet bib, elicited curiosity from earliest times. For example: "As it sits on a twig in the verdure of spring, its grass-green coat is sometimes indistinguishable from the leaves in which it is embowered, itself looking like a leaf; but a little change in position, bringing its throat into the sun's rays, the light suddenly gleams as from a glowing coal" (Gosse, 1847). Like most tropical forest birds, adult todies show no obvious seasonal differences in plumage. However, the dull attire of a summer adult, frazzled from raising three or four ravenous nestlings, can hardly compare with its shiny, semi-iridescent, feathered attire of early spring. Flat, narrow, and shallow, the bill is ideally shaped for feeding—snapping up insects from the undersides of leaves in short, sweeping forays. Todies' short, rounded wings and loosely fluffed plumage are perfectly designed for their short flight paths and non-migratory lifestyles. Species flying the greatest distances on feeding forays have the longest wings.